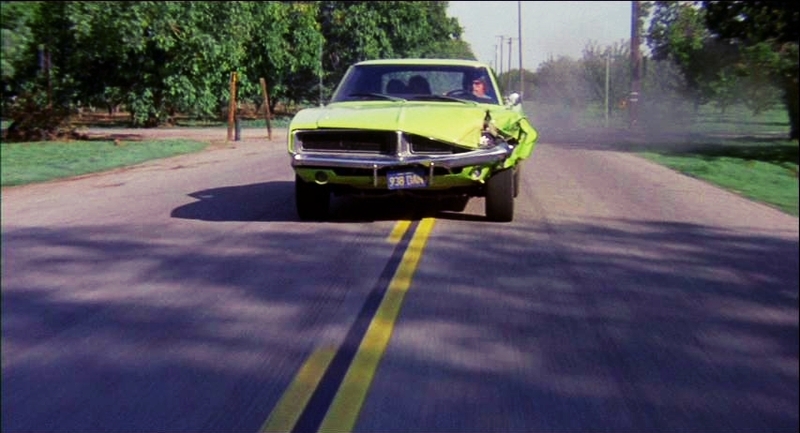 A minimalist car chase movie, Dirty Mary, Crazy Larry has plenty of roaring engines and car stunts, but little in the way of soul. In nondescript rural USA, Larry (Peter Fonda) and his friend Deke (Adam Roarke) rob a supermarket. Deke holds the manager's wife and child hostage while Larry casually walks in and demands the contents of the safe. 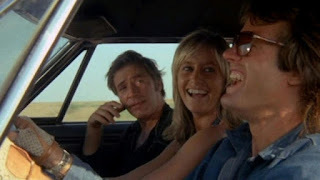 They make their escape in Larry's overpowered Chevy Impala, but not before Larry's one-night-stand Mary (Susan George) insists on joining them. Larry has dreams of joining the NASCAR racing circuit, and needs the money to secure better equipment so that he can compete. Deke is his ace mechanic. Mary is tough as nails and demands to go along for the ride, as the trio escape from a mounting police dragnet. Captain Franklin (Vic Morrow) coordinates the search through the sprawling back country, but Deke's police scanner along with Larry's driving skills and the Impala's pure power allow the escapees to stay one step ahead of their pursuers. Franklin finally takes to the skies in a helicopter, as the chase reaches its climax. Directed by John Hough as an adaptation of the novel Pursuit by Richard Unekis, Dirty Mary, Crazy Larry is a typical piece of early 1970s open road counterculture filmmaking, in the vein of Easy Rider and The Sugarland Express. Dirty Mary has no shortage of horsepower, squealing tires, roaring cars, and the occasional cool stunt, as well as a rolling confrontation between likable bandits and state authority. Hough makes good use of the open and sunny landscape, setting the film in endless fields and backroads that could represent the indistinguishable flatlands of Anywhere America. The acres of greenery are only punctuated by the colourful cars roaring towards the promise of a better personal future for Larry, the ends justifying the means. But there is a limit to how much enjoyment can be derived from hurtling metal down rural roads, and the film starts to suffer due to a lack of a warm heartbeat. Inside the car, there simply isn't enough to root for. Larry, Deke and Mary are limited characters without much to offer, and after establishing their basic identities, the film has little to work with. The running gag of Larry trying to get rid of Mary is quickly predictable (she always finds her way back into the car), and Captain Franklin does little except bark orders down the radio. Larry is half-crazed, his NASCAR dream providing insufficient motivation to fuel the film's emotion. Deke is more cerebral but also more of a blank slate, while Mary is sharp tongued but just along for the ride, for mostly unexplained reasons The script (by Leigh Chapman and Antonio Santean) is unable to take advantage of the quiet interludes to build depth, and the main protagonists remain broad-brush anti-heroes, with little to say about themselves or the world they live in. The film is left to lean heavily on motorized confrontations, and these are delivered with plenty of zest. 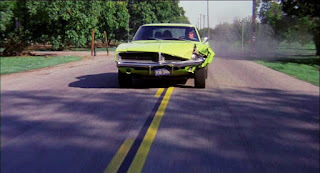 Once the pursuit starts, Larry encounters police cars at regular intervals, and has to outdrive, outsmart or plain outmuscle his hunters, first in the Impala then a bright green Dodge Charger. The horsepower duels are undeniably fun, and Dirty Mary, Crazy Larry delivers on its basic premise: character development is blown out of the window, but its pedal to the metal time for vehicular carnage.